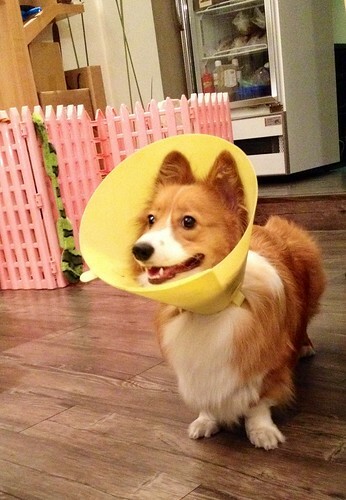 I promise this is not turning into a Corgi blog. 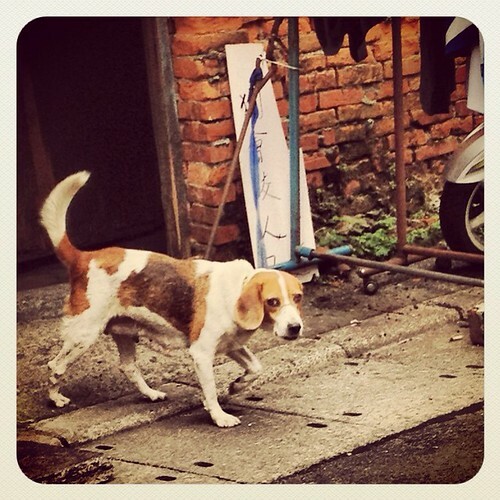 These are just very popular dogs in Taiwan. And yes, I’m still in Taiwan. 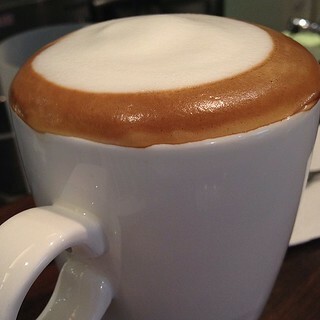 … and, perhaps, also for the beautiful, thick pillow of foam atop their lattes. 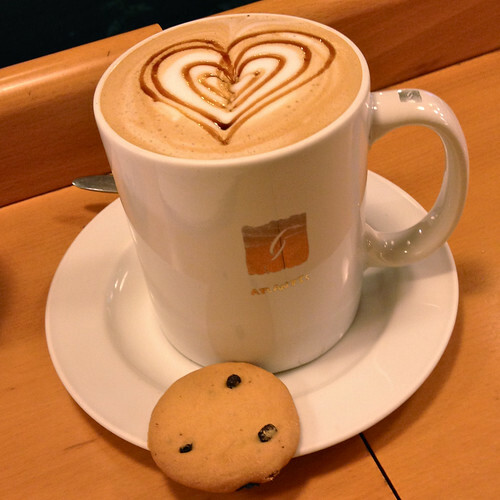 I find the coffee tastes above average, and it is reasonably priced (for Taipei) at 130NT. 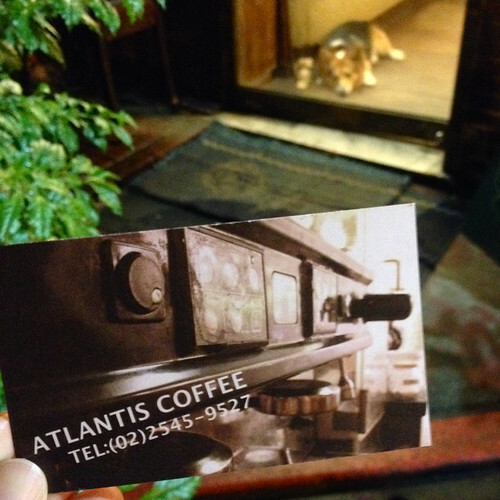 I got mine with an extra shot for 150NT (about $5USD). They also have a range of teas, light sandwich sets, freshly made desserts, waffles and some other sweets. 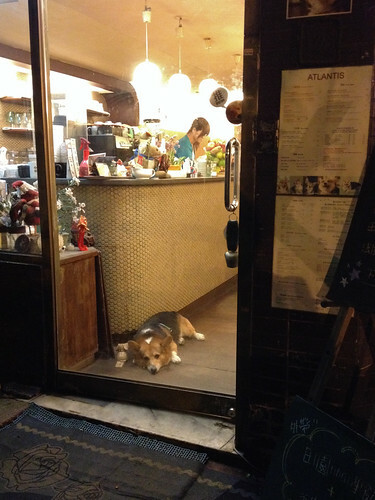 But the sweetest thing, of course, is their CAFE CORGI. 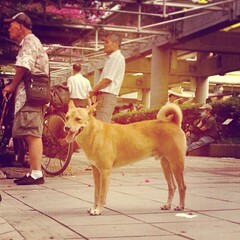 Siapa 夏啪 is this lowrider’s name. I don’t know if Siapa is male or female. That’s the problem with these furry unseen undercarriages. And ungendered spoken languages. 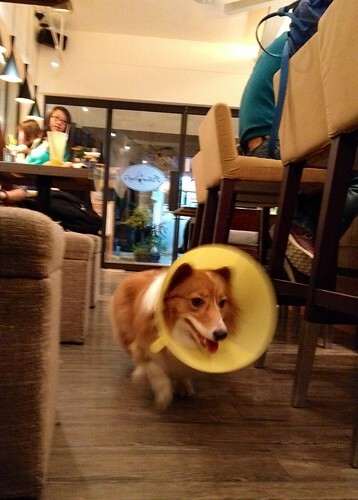 When the cone is not being worn, it’s used to accentuate the furnishings. 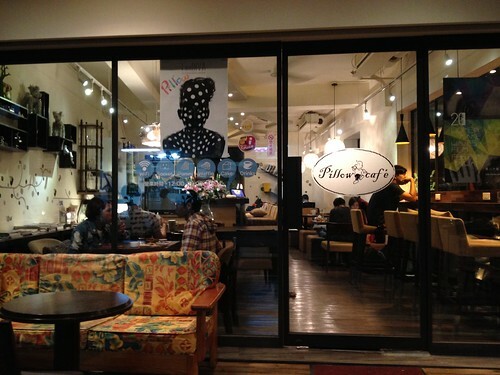 Pillow Cafe is conveniently nestled in an area of good eats, so if quick-heat snacks are not your thing, you can time your meals for before or after your stay. 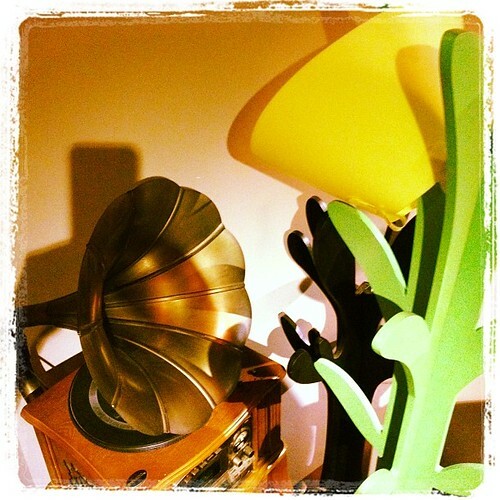 Mostly, though, I think you’ll want to stay, because this place is lovely. The two head silhouettes on their sign are somewhat mysterious. 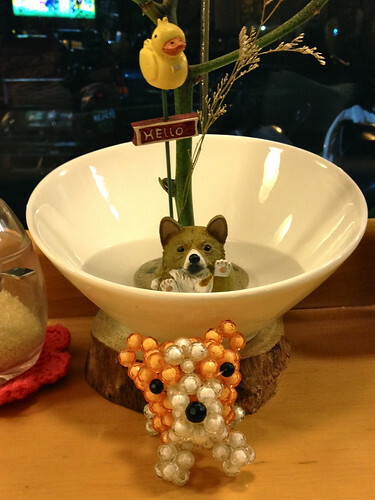 It’s actually the cafe proprietress and her dog, Jeeter 基特 the Corgi. Jeeter is very welcoming and happy to greet visitors. She’s friendly, but also just fine staying out of your way — after you acknowledge her presence upon entrance! Traffic here is relatively slow, based on what I saw on a weeknight. Still, as a small capacity cafe, all the tables were occupied, so I got a tall bar seat at the outwards-facing window. Not a bad option for people-watching. 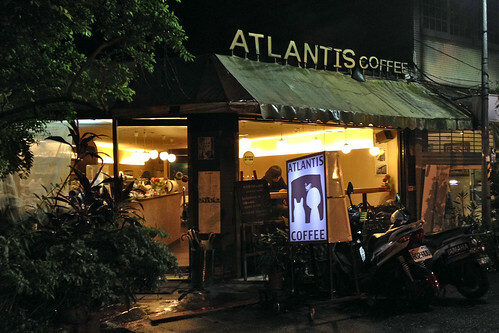 My caramel latte with an extra shot was 130NT (a bit over $4), which I’m now learning is on the lower end of the price scale as far as Taipei lattes go. It was pretty average in taste. The complimentary cookie was a nice gesture. 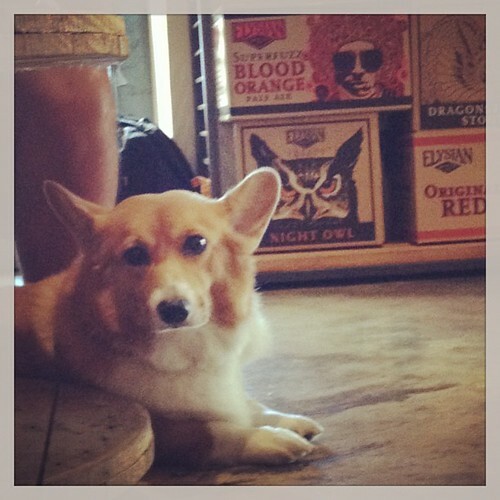 At the tall bar seat, I didn’t get to interact with the lowrider Corgi very much, but I was there to get some work done, anyway. It was just the right, mellow setting for the tasks I had at hand. 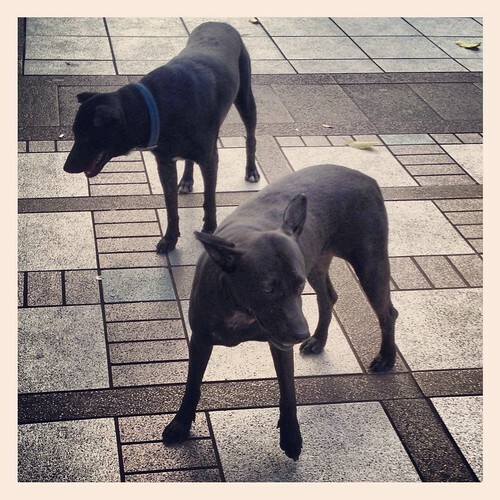 It is far too hot still to schlep my fancy camera around, so I must content myself with cell phone, Instagrammed shots of local dogs. 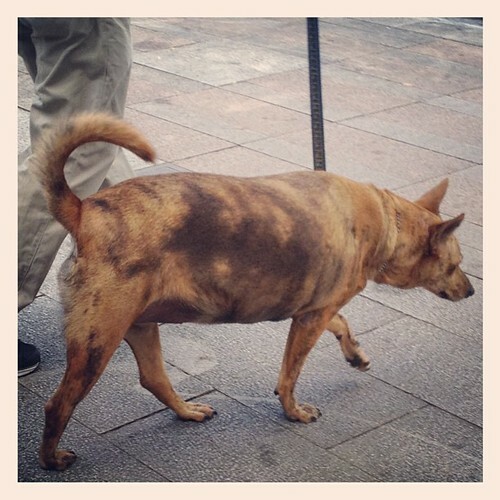 There are a couple brindle tugou accompanied by old men who are fixtures on this strip of Zhonghua Rd. in Ximending, including a store dog at one of my favorite record stores. I never noticed that this one was quite so, well, swollen. The weather hasn’t been very conducive to exercise. 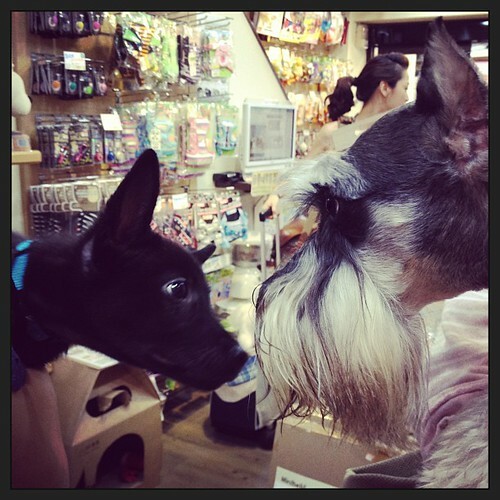 Three-month-old tugou puppy faces off with a Mini Schnauzer, a popular breed in Taiwan. 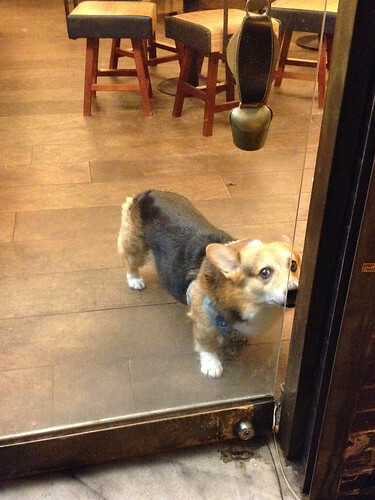 Another popular breed, the Night Owl — I mean, the Corgi, sighted at Cafe Junkies. 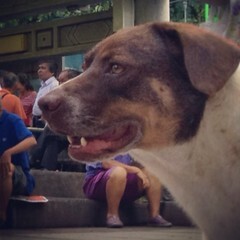 Temples are generally good places for strays to hang out. Nobody wants to provoke the ire of the gods by abusing innocent creatures in their midst. They’re also highly trafficked, dense sites where scavenging yields rich rewards — especially when temple monks supplement the fare with regular handouts. 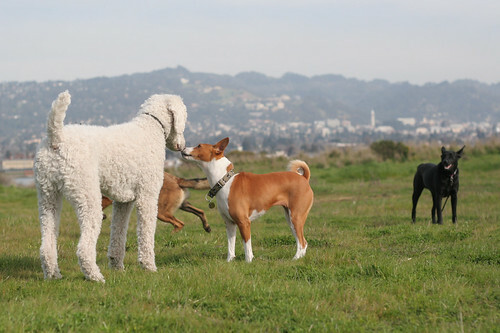 The yellow dog on the left was accompanied by the Pointer-esque mix on the right. They were hanging out at the large public square by Longshan Temple, as natural a part of the scene as the throngs of chainsmoking old men. They left as a unit and wound down a side alley, tempting me to follow… Maybe next time. In honor of Queen Elizabeth II’s Diamond Jubilee, celebrating 60 years as England’s Monarch, The House of Two Bows is pleased to present a guest post by Jen of Volunteers 4 Paws. Enjoy! The epigraph reads, “Uneasy lies the head that wears a crown,” a quote from Henry IV, Part II. 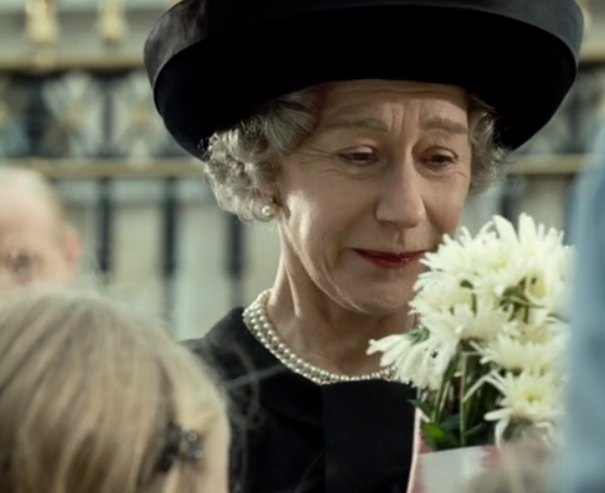 Stephen Frears’ The Queen concentrates on one small part of the Queen of England’s now 60 year reign (Diamond Jubilee!) — the days following the death of Princess Diana in 1997. 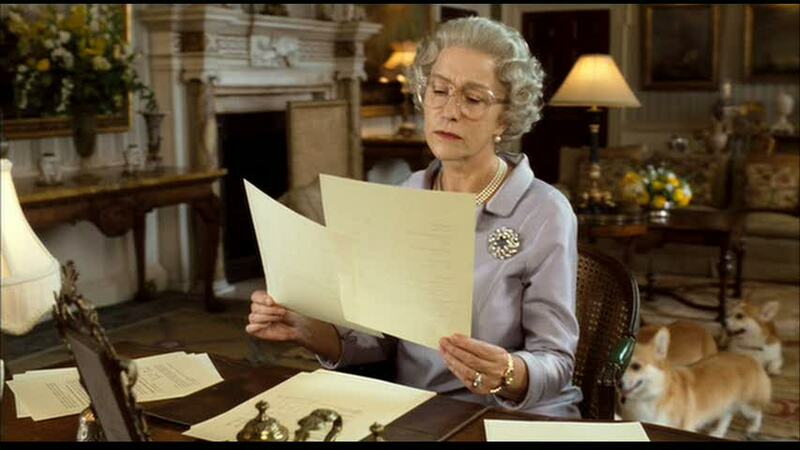 Helen Mirren brilliantly portrays the stoic Queen Elizabeth II. The ever dignified James Cromwell does an uncanny Prince Phillip and Michael Sheen plays a convincing Tony Blair. The Queen sticks to tradition, preferring to view Diana’s death as a personal family tragedy. Her instinct to protect her grandsons (Princes William and Harry) takes massive precedence over helping Britain, and the rest of the world, cope with Diana’s death. 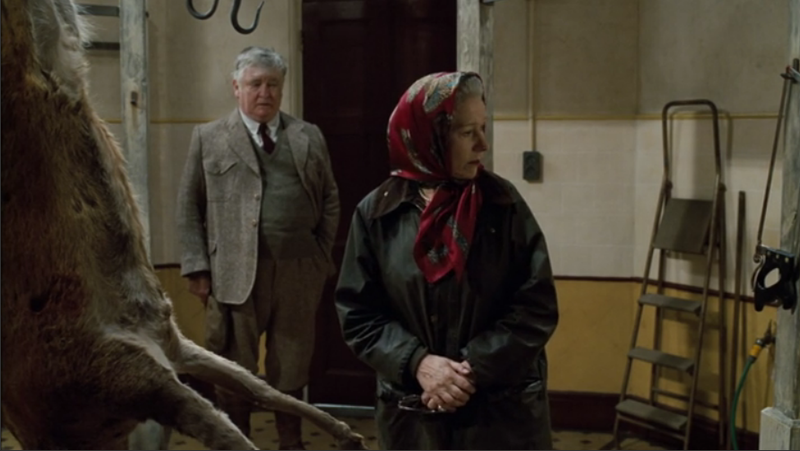 Frears beautifully directs a hidden story line with the Queen and a stag. She encounters a beautiful, highly sought after stag when her car gets stuck in a creek. 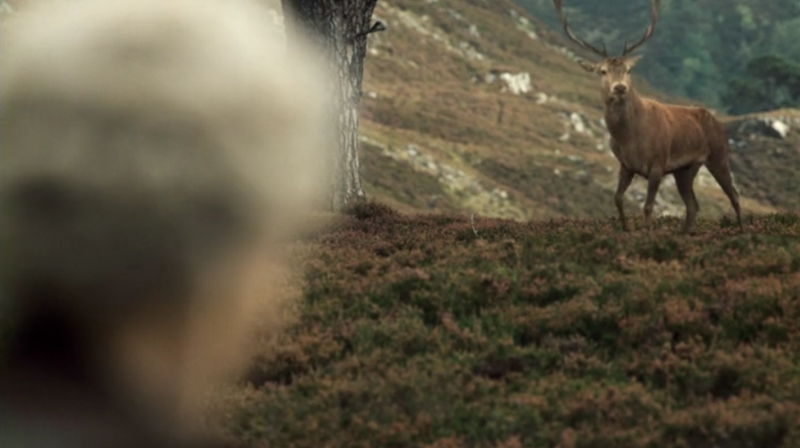 She begs the Stag to leave, shooing it as she can hear stalkers (hunters) in the distance. 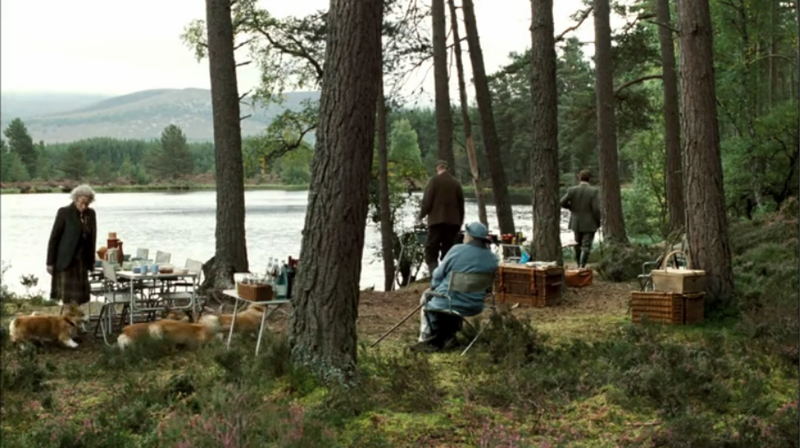 A poignant scene follows later in the film. The Queen has found out that stalkers have killed the impressive stag and she takes it very much to heart. Still, the Queen does not let one of subjects see her emotion, turning away to shed a tear for the fallen prized stag. This is a film that begs to be interpreted by its viewer. Though everyone speaks and the events are clear – there is a lingering question — can we ever really know a person? The Queen is shown at the end of the each day struggling to make sense of it all. Is she just like us? She has a family, she faces hardships, she has feelings and above all she is a fallible human. 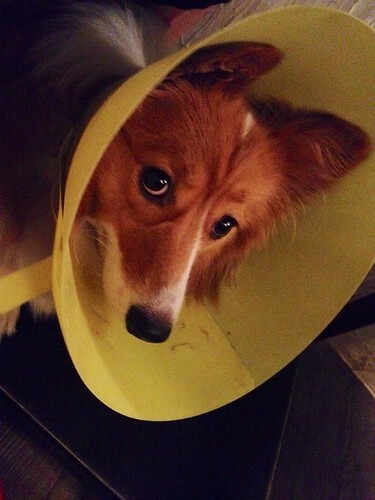 One thing that makes her quite human is her attachment to her dogs. 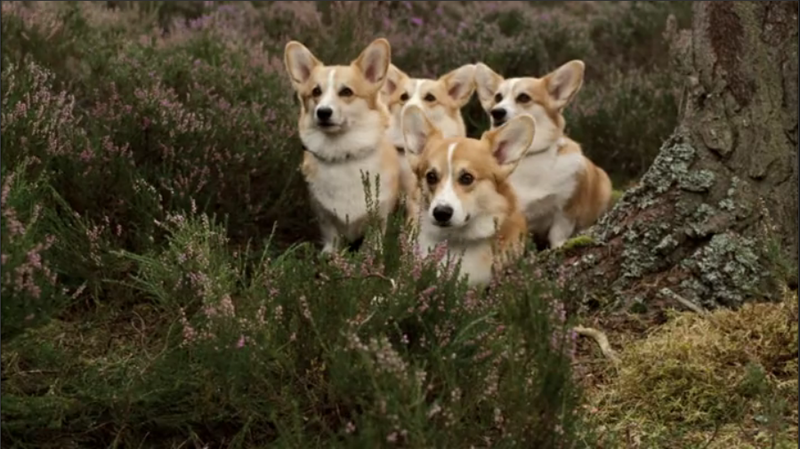 The Queen’s most well known dogs are, of course, her Pembroke Welsh Corgis. 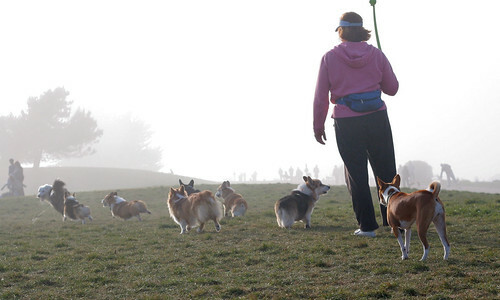 She has kept Corgis for 60 years. 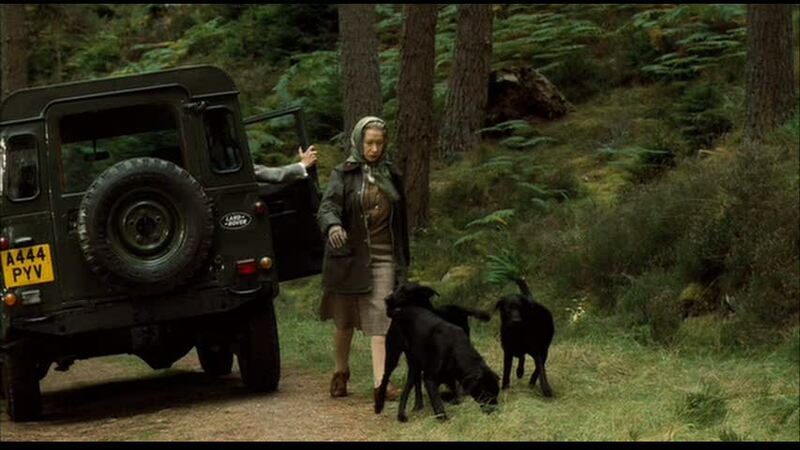 The film shows the Queen doing quite normal things like camping and bringing her dogs along. She speaks to them, walks them frequently and includes them in her matters of State. Where she goes, they go. 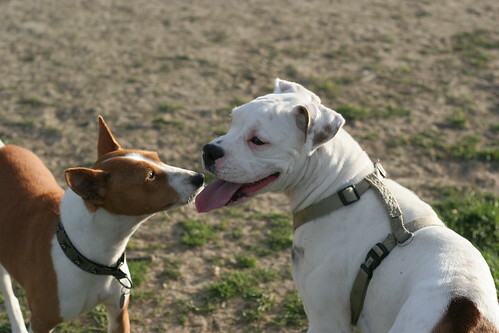 Real attention is paid to the involvement of the dogs in the Queen’s every day life, whereas in other films the dogs play a minor role, a comedic role, or some other negligible function. 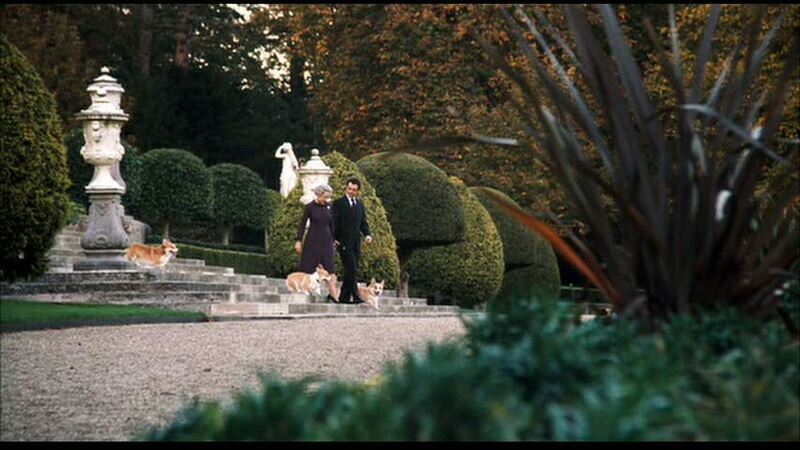 Though these Corgis and Labs weren’t on Frears’ billing, they seem to play quite a hefty role in how the Queen lives daily. Pretty cool… considering her profile and lifestyle. With all the current focus on “The Royals,” this film is a must-see. It seeks to humanize the figure head of the British monarchy. Is the Queen just like you or me? Or does she lead a life we will never fully understand – and we therefore have no business criticizing in time of tragedy like that of the loss of “The People’s Princess?” I suppose it is up to your interpretation. Following up on Jen’s observations, I tracked down the DVD and rifled through the audio commentary track with director Stephen Frears and screenwriter Peter Morgan. It seemed to me that they were less sensitive to the role of the dogs in the Queen’s daily life than we were, as they themselves were taken aback by the presence of the Labradors. 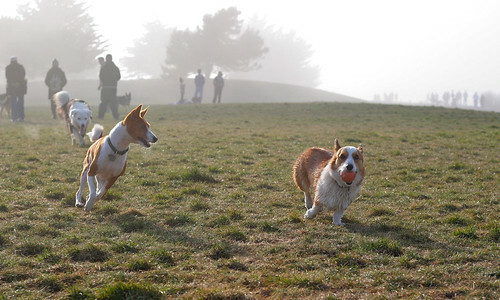 “The Corgis haven’t been dyed black, right?” “No, those are Labradors. 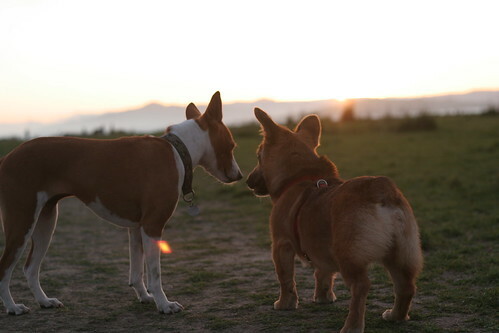 I suppose it’s a different kind of walk, isn’t it?” they joke to each other. 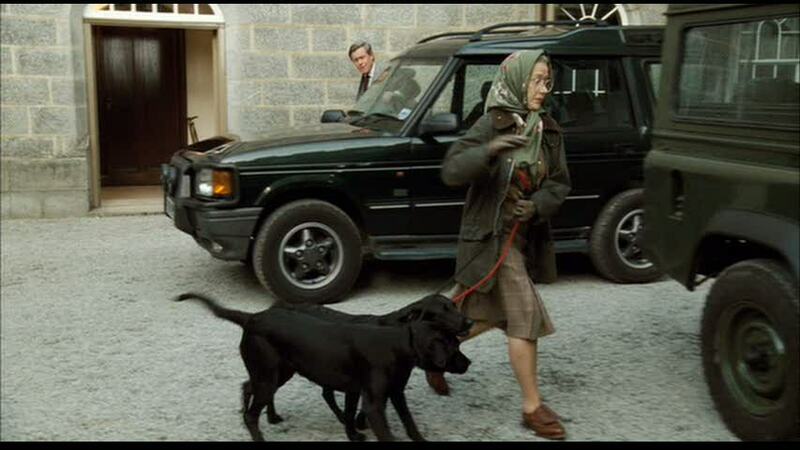 They also pointed out an amusing goof, where two Labs enter the Land Rover in one scene, but three Labs exit the vehicle. 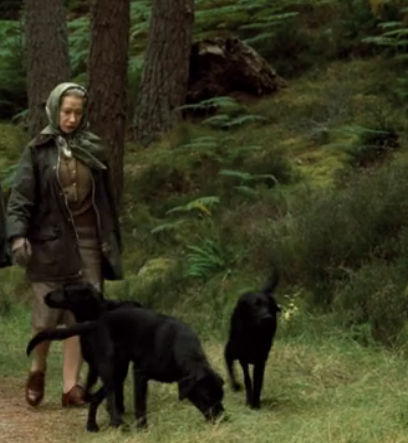 Nevertheless, no film about the Queen would be complete without some reference to her famous canine companions. 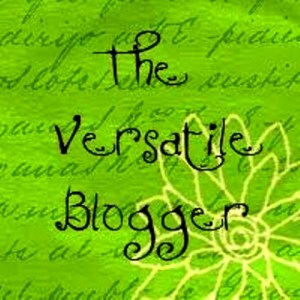 Thanks again to Jen for her astute review! 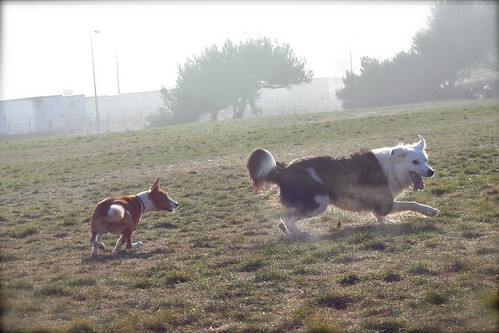 You know how there are some dogs at the park who delight in running after other dogs, just because they can? That’s Bowpi. Of course, it’s even better if they turn around and chase her. But when the dog in question can’t be distracted from their singularly important task (Ball!!! ), she’s happy to run alongside. 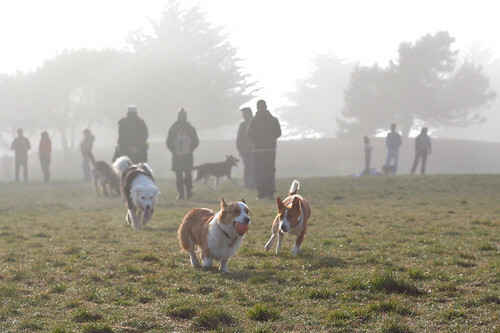 There was some amazing fog at the park that day. 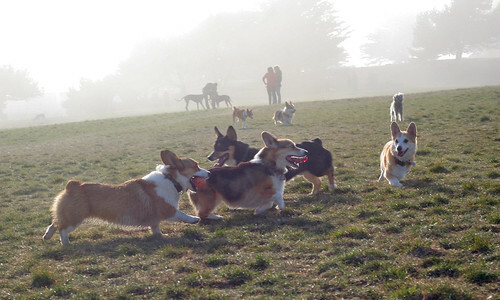 At one point, we found ourselves knee-deep in a stream of Corgis. The woman with the Chuck-It had just one, Ruby, whom we’d been watching and listening to during her obsessive game of fetch. Another woman had all the others. It was pretty intense. There were two or three more that didn’t even make it into this frame. 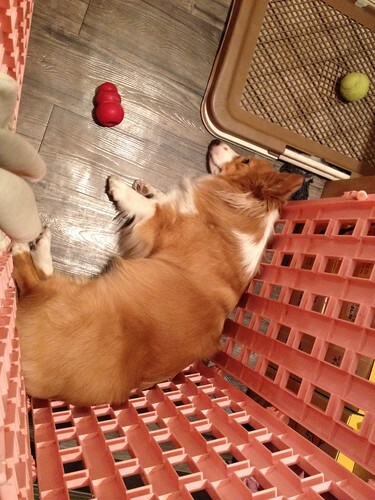 And every single one of them was more interested in cheerleading for Ruby, rather than chasing Bowpi! WAYTOGO! YOU GOTTHEBALL! ATTAGIRL RUBEEEEEE! Yup, these little guys sure do know how to make a fuss.